Here are the first live photos of the 2011 Acura TSX, which has shed some of its "controversial" Bucky the Beaver styling in favor of a slightly more subdued snout. Other than the nose job, it's still just newish. The other changes include tweaks to the materials on the interior, including dark trim pieces and an updated parking brake handle. Our favorite bit from the press release? There are "new garnishes for the steering wheel." Delicious. 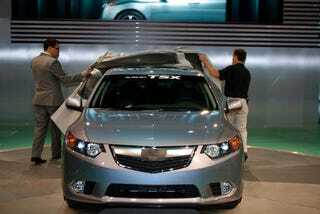 The 2011 TSX is not set to debut until later, and there are staged photos wandering around, but floor reporter Matt Helm (the other Matt) encouraged the crew to drop cover for him. Perhaps we should send him to do some work grabbing Booth Professional photos.